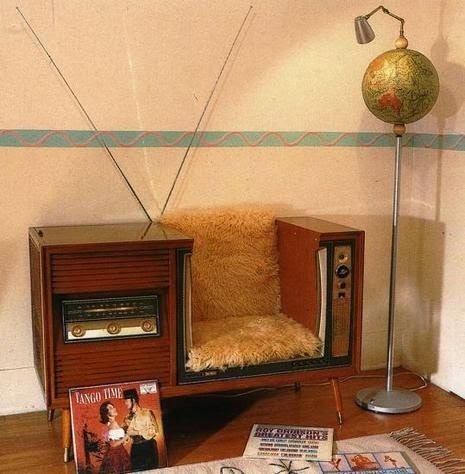 Vintage television sets pose a conundrum for the retro lover: they are awfully cool to look at, but require some finagling with a converter box and cables to make them functional in today's high-tech world...that is, if their cathode ray tube is still working. But if you have no intention of watching programs on your set or are unable to, you don't have to recycle it or throw it away. It turns out that there are several cool things you can do with a vintage TV that will add some retro grooviness and a conversation piece to your digs. 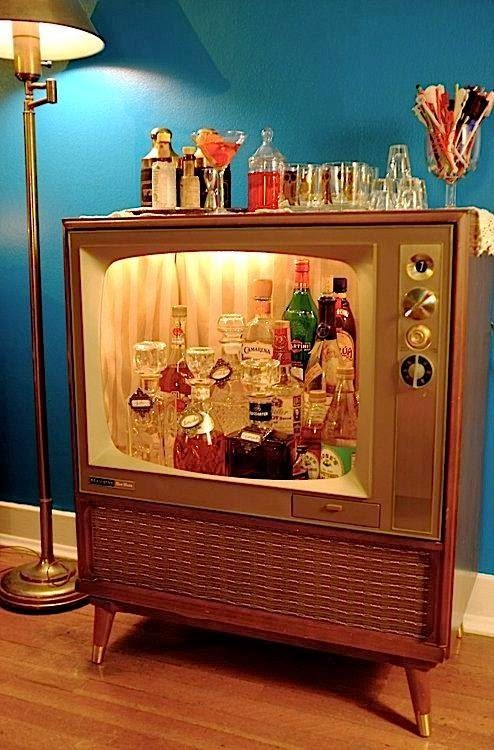 For starters, I love this bar idea that a friend on Pinterest spotted and sent to me. The owner added some fabric or decorative paper to the inside of the tube, and the martini glasses and swizzle sticks are a nice touch. 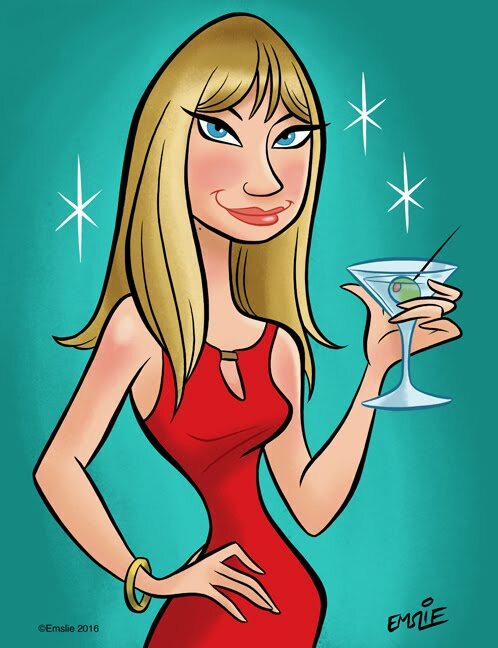 I'll drink to that! I can has bed? 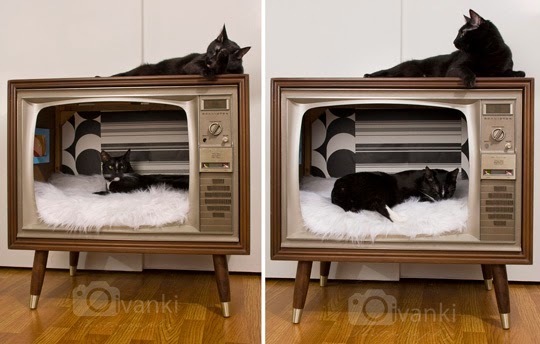 Give your pet a groovy pad of their own by converting the set into a cozy sleeping spot. I love that this cat owner decorated the inside with '60s graphics and a shag rug. The only disadvantage is that a kitty on top can't get warm from a non-functioning set. This requires one of those sets that was built into a stand and looks like a piece of furniture by itself. An awesome conversion, although this "chair" may only hold a small child or a very skinny adult. Again, love the shag cushioning! Not sure how they access the tank to clean it, but this is another creative idea. Don't you wish you had held onto your parents' old set? These are fantastic! 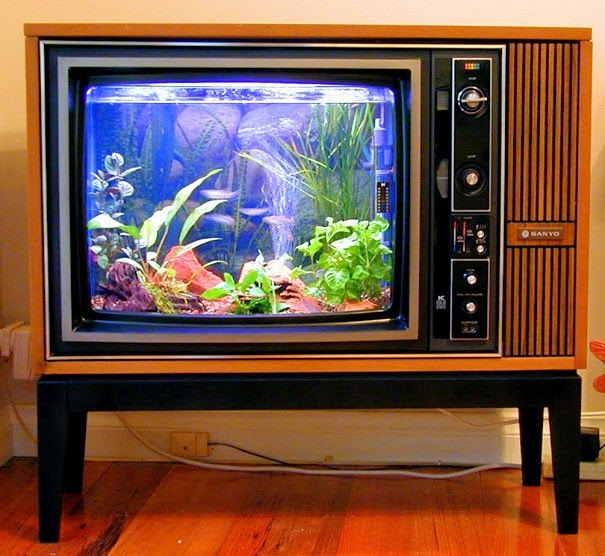 I've always wanted to convert a retro floor TV into a fish tank, glad to know it will look as good as I pictured it!